"Individual Islamists may appear law-abiding and reasonable, but they are part of a totalitarian movement, and as such, all must be considered potential killers." I wrote those words days after September 11, 2001, and have been criticized for them ever since. But an incident on March 3 at the University of North Carolina in Chapel Hill suggests I did not go far enough. 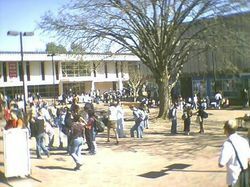 The Pit at the University of North Carolina in Chapel Hill, the pedestrian area where Taheri-azar struck. That was when a just-graduated student named Mohammed Reza Taheri-azar, 22, and an Iranian immigrant, drove a sport utility vehicle into a crowded pedestrian zone. He struck nine people but, fortunately, none were severely injured. Until his would-be murderous rampage, Mr. Taheri-azar, a philosophy and psychology major, had a seemingly normal existence and promising future. In high school, he had been student council president and a member of the National Honor Society. The Los Angeles Times writes that a number of UNC students found him "a serious student, shy but friendly." One fellow student, Brian Copeland, "was impressed with his knowledge of classical Western thought," adding, "He was kind and gentle, rather than aggressive and violent." The university chancellor, James Moeser, called him a good student, if "totally a loner, introverted and into himself." In fact, no one who knew him said a bad word about him, which is important, for it signals that he is not some low-life, not homicidal, not psychotic, but a conscientious student and amiable person. Which raises the obvious question: Why would a regular person try to kill a random assortment of students? Mr. Taheri-azar's post-arrest remarks offer some clues. He told the 911 dispatcher that he wanted to "punish the government of the United States for their actions around the world." He explained to a detective that "people all over the world are being killed in war and now it is the people in the United States' turn to be killed." He said he acted to "avenge the deaths of Muslims around the world." He portrayed his actions as "an eye for an eye." A police affidavit notes that "Taheri-azar repeatedly said that the United States government had been killing his people across the sea and that he decided to attack." He told a judge, "I'm thankful you're here to give me this trial and to learn more about the will of Allah." In brief, Mr. Taheri-azar represents the ultimate Islamist nightmare: a seemingly well-adjusted Muslim whose religion inspires him, out of the blue, to murder non-Muslims. Mr. Taheri-azar acknowledged planning his jihad for more than two years, or during his university sojourn. It's not hard to imagine how his ideas developed, given the coherence of Islamist ideology, its immense reach (including a Muslim Student Association at UNC), and its resonance among many Muslims. Were Mr. Taheri-azar unique in his surreptitious adoption of radical Islam, one could ignore his case, but he fits into a widespread pattern of Muslims who lead quiet lives before turning to terrorism. Their number includes the hijackers responsible for the attacks of September 11, the London transport bombers, and the Intel engineer arrested before he could join the Taliban in Afghanistan, Maher Hawash. A Saudi living in Houston, Mohammed Ali Alayed, fit the pattern because he stabbed and murdered a Jewish man, Ariel Sellouk, who was his one-time friend. So do some converts to Islam; who suspected a 38-year-old Belgian woman, Muriel Degauque, would turn up in Iraq as a suicide bomber throwing herself against an American military base? This is what I have dubbed the Sudden Jihad Syndrome, whereby normal-appearing Muslims abruptly become violent. It has the awful but legitimate consequence of casting suspicion on all Muslims. Who knows whence the next jihadi? How can one be confident a law-abiding Muslim will not suddenly erupt in a homicidal rage? Yes, of course, their numbers are very small, but they are disproportionately much higher than among non-Muslims. This syndrome helps explain the fear of Islam and mistrust of Muslims that polls have shown on the rise since September 11, 2001. The Muslim response of denouncing these views as bias, as the "new anti-Semitism," or "Islamophobia" is as baseless as accusing anti-Nazis of "Germanophobia" or anti-Communists of "Russophobia." Instead of presenting themselves as victims, Muslims should address this fear by developing a moderate, modern, and good-neighborly version of Islam that rejects radical Islam, jihad, and the subordination of "infidels." Mar. 14, 2006 update: For further information on this case as it unfolds, see "More on the North Carolina Jihadi, Mohammed Taheri-azar." July 29, 2006 update: I am pleased to report that rayra.net and Freedom's Enemies have both produced lists of Sudden Jihad Syndrome incidents in the United States. I hope they continue to update their logs as incidents tragically continue to occur. Jan. 2, 2008 update: I discuss having coined the term Sudden Jihad Syndrome in this article on Mohammed Reza Taheri-azar today at "Sudden Jihad Syndrome – It's Now Official," on the occasion of a U.S. government having picked it up. Nov. 20, 2009 update: For another compilation of Sudden Jihad Syndrome incidents in the United States, see JeffHead.com. Related Topics: Muslims in the United States, Terrorism | Daniel Pipes receive the latest by email: subscribe to the free mef mailing list This text may be reposted or forwarded so long as it is presented as an integral whole with complete and accurate information provided about its author, date, place of publication, and original URL.